Ricky Gervais's recent TV series 'Life's Too Short' (a pun related to central character Warwick Davies' height) proved to be middling, at best. It's a surprise that another of his shows is out so soon, emerging under the radar as a Channel 4 television pilot. 'Derek' is something of a return to form, with hints of Gervais' excellent past work in 'The Office' and 'Extras'. 'Derek' is a mockumentary set in a care home, with the good-hearted titular character played by Gervais, and support from Kerry Godliman as his perennially single boss, Hannah, and Karl Pilkington as downbeat caretaker and flatmate, Douglas. For a Gervais (writer and director) comedy, 'Derek' a surprisingly touching tale of friendship and romance. The character of Derek has been criticised for mocking people with learning disabilities, unfairly in my opinion. The slapstick humour is perhaps the source of consternation for most, with Derek generally on the receiving end. Yet there is little doubt that Derek is a good guy, and the weakness here is in the style of humour, which is at odds with the typically moribund setting. Other jokes are better however, including the ridiculous gem: "Who would win out of a suicide bomber and a shark?" 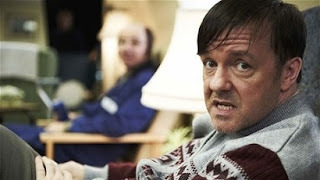 The usual Gervais directorial trope of glancing into the camera following a punchline sporadically appears in 'Derek', although should the series continue, this will hopefully be a technique used sparingly - 'Life's Too Short' suffered from its overuse. Possibly the most overt similarity to his previous efforts is the close friendship between Derek and Hannah, reminiscent of Maggie and Andy in 'Extras'. This is a welcome comparison however, considering the latter relationship proved so joyfully engrossing. 'Derek' is much more of a comedy-drama than simply a straight comedy, with one particularly empathetic scene involving Derek standing out. Ricky Gervais is underrated as an actor, and as anyone who has seen the Christmas special of 'Extras' can attest to, he has the ability to deliver heartfelt emotion. He delivers again here and while part of me would like to see more of Derek, the other suggests that this is perhaps the time to quit while you're ahead. Your move, Gervais. UK users can watch 'Derek' on Channel4.com.